China’s Currency Gets “Reserve Status.” The IMF bestowed this favor upon the Chinese government on Monday. This news doesn’t really mean anything. But an entire industry of scam financial newsletters will start selling “emergency guides to protecting your money”, which will include, in the end, buying gold. Buying Gold Looks Like a Terrible Idea. Gold hit a six-year low on Friday. No one wants to buy gold, except this completely ridiculous scam website, which features a photoshopped picture of Leonardo DiCaprio. Gold goes up when inflation goes up. But where in the hell is inflation going up? Inflation is Not Going Up in the United States. Forecasts are at an all-time low. Commodity prices are low (and commodities are the raw materials that go into making stuff). Resource utilization is low, but I don’t even know what that means. So why the hell would the Fed raise rates in December? The Fed is Afraid of Keeping Rates Low Too Long. This rate hike is all about ONE thing: raising rates so that investors remember the Fed can do it. And keeping a promise. Then there will be no rate hikes for all of 2016, or until late late late 2016. So, what’s the trade? Stocks are free to continue their upward climb, which suggests certain currency pairs are going to the moon. 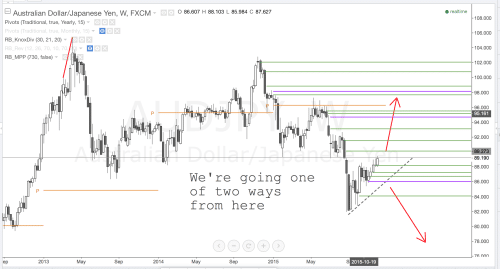 Is the AUD/JPY Going to the Moon? It sure looks like it might. As Japanese traders buy Australian debt, the Australian Dollar keeps climbing. Where will it stop? If it’s a “carry trade,” it might go for thousands and thousands more pips. See the chart of the day. The AUD/JPY currency pair is highly correlated to the stock market indexes. If U.S. Stocks go up, this pair does, too. If U.S. Stocks tank, so does this currency pair. We’re on the edge of the knife right now – and we could see it go either way. This Excellent Book on Tidying Up Your Life. I just loved this book. If you want to simplify your life, this is where to start. This Excellent Book on the Power of Habits. I could not put this book down. I recommend you buy this book. But if you just want me to summarize this book for you, stay tuned, I am creating a newsletter that includes summaries of the best books I’m reading.